At first glance, it seemed that Donald Trump had been foolish in going after Representative John Lewis, an authentic American hero. Through intense commitment, moral clarity, and physical courage, young John Lewis earned a place in American history long before he ran for Congress. By the time he’d turned 25, Lewis had scratched out what he surely knows is the first paragraph in his eventual obituary: beaten while praying on the Edmund Pettus Bridge. Since then, John Lewis has continued to work for his vision of a just society, and over time has tried to transport his iconic status in the civil rights movement to other issues, including economic justice, opposition to war, protecting the environment, gun control, and standing up for gay rights. It’s a liberal Democratic agenda, promoted with speeches on the floor of Congress–and elsewhere, legislative efforts, and sometimes civil disobedience. Lewis has even published a graphic novel trilogy, offering his experience as inspiration for civic engagement to young people. He IS a comic book hero! Lewis announced that he would be skipping Donald Trump’s inauguration because he didn’t consider the president-elect to be legitimate. Reflexively, Trump tweeted back with venom. It’s a familiar pattern, just like questioning the heroism displayed by Senator John McCain (R-Arizona) as a prisoner during the Vietnam War. The easier move, obviously, is to acknowledge heroism, sincerity, and commitment–and then discuss substantive political differences…politely. Republican members of the Senate Judiciary committee did exactly that when Representative Lewis testified against the confirmation of Attorney General designate Jeff Sessions (R- Alabama). Trump’s Twitter attacks on Rep. Lewis immediately occasioned outrage, and the Internet filled with rather obvious comparisons of the two men’s historic political commitments. 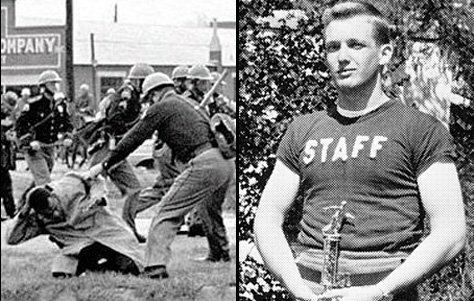 While Lewis was being beaten in Selma, Trump was cloistered in an expensive private military school. You can pick any year since then and find similarly stark differences in life choices: both Trump and Lewis have been consistent in living their values. Democrats in Congress rallied to announce their friendship and support; a few agreed to skip the inauguration. And even Republicans who criticized his stance on the inaugural mostly began by announcing their respect for his record. Trump’s tweets didn’t undermine Lewis’s support with anyone who already supported John Lewis. But it’s not clear that many of Trump’s supporters will desert him for criticizing a liberal Black congressman. They’ve had to grow accustomed to Trump’s hyperbolic invective (recall, Meryl Streep is overrated….). This won’t be the last straw for those who found a way to stick with Trump through so much already; they’ve learned to swallow and forgive. As to John Lewis? The fact that he’s continued his efforts, maintaining his commitments over fifty years since Selma, makes him a difficult hero for many Americans. While opponents of liberal social and economic policies can speculate on what Martin Luther King might have said in this different time, John Lewis in Congress offers them no such latitude. Those who claim they would have supported the civil rights movement in 1965–most Americans didn’t–might clutch for a moment when they realize they have the opportunity to do so today. This entry was posted in Uncategorized and tagged Alabama, Arizona, Donald Trump, Georgia, hero, icon, inauguration, Jeff Sessions, John Lewis, John McCain, Meryl Streep, Selma, twitter. Bookmark the permalink.